One of the key reasons why a business fails to secure funding is an inability to pass whatever “due diligence” tests are set by the investor or lender. This is the case whether you are seeking a £25,000 start-up loan or looking to do an IPO on the London Stock Exchange. 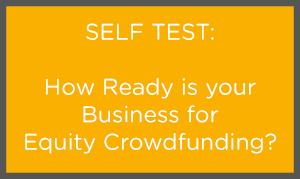 Together with our partners, we have prepared a series of self-test tools that allow you to assess how ready your business is for different types of finance. Each test takes only about 10 minutes to complete, at the end of which you will be sent a report with your score. Try out some of the self-tests below now - more self-tests coming soon! Additionally, as a premium member of Informed Funding, we will be rolling out three Strategic Performance Assessments (SPA) – whether you are in early stage, fast growth or turn around mode! Again, these assessment take only 10 minutes to complete and you will receive an online cloud assessment, business assessment results consultation, and SPA report.